Built in 1918, the Goulburn Roundhouse was saved from demolition by the Goulburn Roundhouse Preservation Society. It is now home to a large collection of rolling stock and various exhibits, as well as privately owned locomotives and carriages. Access to the site is by guided tour, and there is quite a bit to look at! The museum is open from 10am to 4pm Tuesday to Sunday. For further information, please visit their website. Vulcan 0-6-0 R285/X-10 Class – 1076. A total of six 0-6-0 tank engines were ordered from Vulcan Foundry for use in the Sydney suburban area. Known as the R285 class, they were doomed to failure, largely due to their smaller driving wheels, and were instead allocated to shunting in Sydney. 1076 was renumbered 1804 as part of the 1924 renumbering system, although when converted to a steam crane in 1927 it was renumbered to 1076. 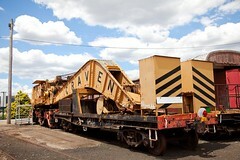 After the crane was removed in 1959, the locomotive was used as a shunter at Port Kembla, although it was also used by the mechanical branch as a static boiler for various duties. 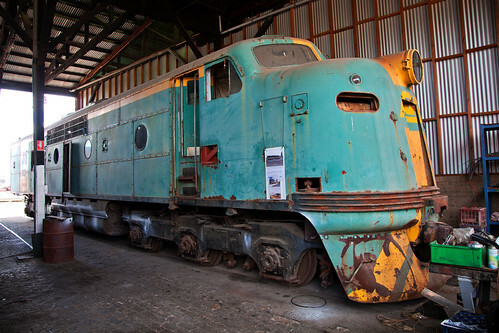 The locomotive was withdrawn in 1972, and saved from scrap by the NSWRTM, where it was stored for a number of years on rotten row until the Trainworks construction, when the locomotive was moved to Goulburn where it has been dismantled and is under restoration. 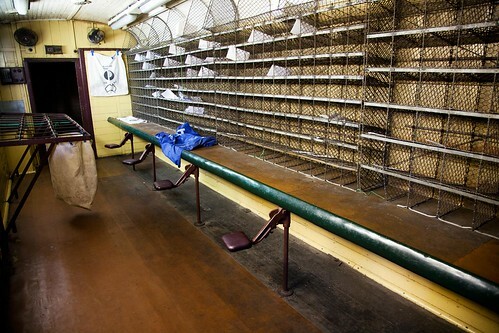 Note: No photograph is available at this time for 1076, as it is under restoration and is in multiple pieces! Dubs & Co 2-6-0 B55/Z24 Class – B390/2419. Originally part of an order for twenty-five locomotives from Dubs & Co (Glasgow, Scotland), the class entered service in 1891. Originally used in mainline freight service around the state, they were gradually cascaded down to lesser roles by the widespread introduction of the 50 Class locomotives from 1896 onwards. The first of the class would be scrapped in 1937, although a number survived as shunters and in private industry, including B390 which was used at the Marulan South Quarry until 1957. 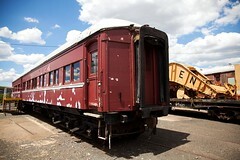 It was transferred to Sydney in 1963 to be restored by the Rail Transport Museum, Enfield. 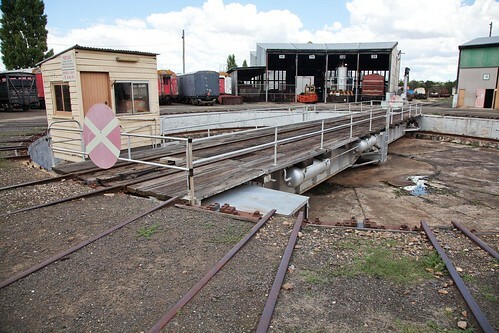 It is currently allocated to Goulburn Roundhouse for display. 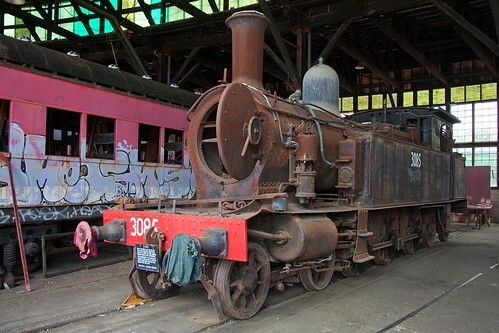 Beyer Peacock & Co/Eveleigh Railway Workshops S/C30 Class – 3085. The 4-6-4 C30 Class were built to operate suburban passenger services in the steadily growing Sydney metropolitan area, although they were later pushed further afield as electrification slowly took over the duties that they were built for. Often operating trains of up to ten cars long, these tank engines quickly proved their worth on the steep grades around Sydney, especially on the Northern lines. The class also saw use on the steeply graded Camden Line, as well as between Wollongong and Moss Vale. Baldwin “Mikado” 2-8-2 D-59 Class – 5908 and 5916. These two locomotives were originally part of a twenty-strong oil-burning class ordered by the NSWGR from the Baldwin-Lima-Hamilton Corporation in the USA. 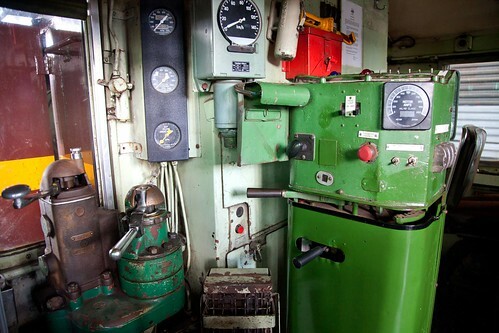 The decision to order oil-burners was largely based on widespread coal shortages, although most of the class would be converted to coal burners over their service life (both 5908 and 5916 were preserved as oil burners, having never been rebuilt). Nominally based on Short North and North Coast Line workings, the class were used between Sydney and Goulburn in the late 1960’s, before the section was taken over by diesels. 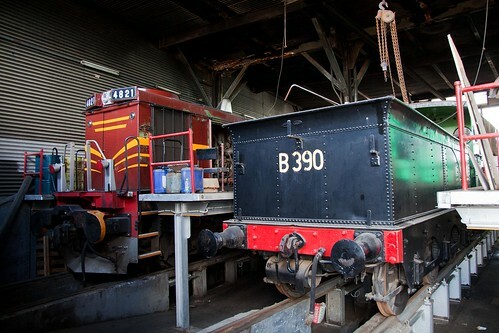 The two locomotives were originally part of the collection at Thirlmere, however with the construction of the Trainworks museum, they were rendered surplus and re-allocated to Goulburn. A. E. Goodwin Co-Co 48 Class – 4821. 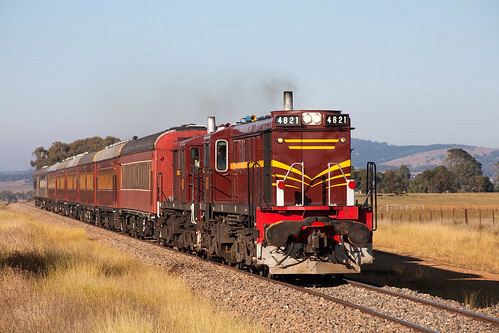 The first of the 165-strong class to be allocated to Goulburn, this locomotive is fully operational and is available for hire by other heritage organisations. Most recently, the locomotive has been used on ARHS ACT passenger trains. General Electric Bo-Bo L80T – D1. 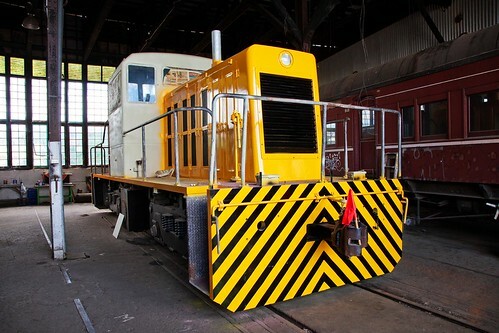 Purchased as part of an order for two diesel-electric shunting engines by Southern Portland Cement Ltd (now Blue Circle Southern Cement) to be used at their Marulan South quarry. Unlike sister engine D2, which remains in commercial service with Manildra Group, D1 is under restoration at Goulburn, although it is also used for shunting the roundhouse when required. Clyde Engineering Co-Co GM12 Class – GM19. 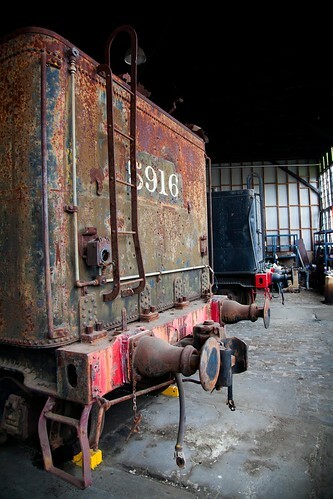 Although GM19 is not owned by the GRPS (it is owned by a private lease company, RailPower), it is stored at the roundhouse pending restoration to service. Originally built for Commonwealth Railways in 1957, GM19 wears the livery of Australian National. 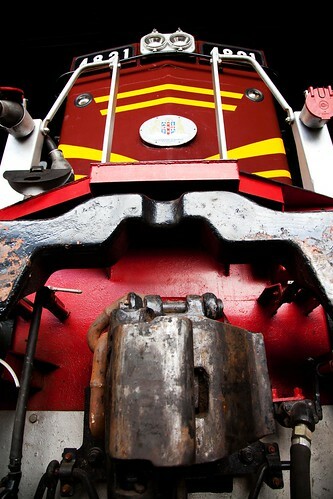 The roundhouse also has a number of carriages and wagons on display, including a Craven 70 ton breakdown crane (1072). The roundhouse is also home to three former NSW SRA paybus vehicles, which were used to deliver the pay packets to employees around the state. Visited the museum on Thursday 14/2/13 and enjoyed the guided tour verry much. I will definately return when I have visitors to bring along.